This is so good! Why can't all books be like this? No 'he said /she said/she felt' etc. Just a bunch of great voice acting with sound effects. This style of audio book was perfect for my long drive over the holidays. It turned a 4 hr drive into a thrilling and fast experience! Great acting, superb sound effects and really cool story. 10/10 would recommend! Now I'll be disappointed with every other book I read. Gripping audio drama which successfully recreates the thrills and terror of the original Alien movies. Fantastic, authentic performances all round. Thoroughly recommend! Was expecting this to be cringey... but it was really well done. I loved the characters, I loved the sound effects. This was a badass little audiobook production! Absolutely loved it, the performance from the cast is great. I can not wait to start the next episode. An entertaining take on what occurred to Ripley between Alien and Aliens. Well worth the listen! This was my first introduction to this format of audible book. At times it becomes busy and noisy and it becomes easy to lose yourself but since the story is generally straightforward it is not difficult to get back on track. Overall it is well produced. The story was not to adventurous and didn’t vary into any new dimensions of the Aliens story. Ripley held back the story rather than allowed to to flourish. Worth a listen for Alien fans and those interested in this format. Classic story in the Alien setting, well acted and genuinely exciting. Started listening and did not stop! So great were the voice performances and sound effects that, when I closed my eyes, I could see the story unfold in my mind. Ties in seamlessly with the rest of the franchise - a must for fans. I remember watching the film Alien, many years ago, so the thought of a freebie in the same genre appealed to me. This turned out to be one of the best things Ive listened to in ages. The storyline plays along the similar Alien theme of picking off crew members one by one, but the plot kept me listening and gripped throughout the entire series. This has been one of the best books I've listened to in a long time absolutely fantastic close your eyes sit back and your in the film cannot recommend enough what a great listen this was. Simple, unbelievable story/scenario. Terrible dialogue. Sad the Alien franchise has come to this. At least it was free. I was sceptical of this at first, but let me tell you that this was one of the best stories I've read/heard in recent memory that's set in the Alien universe. After trying to wash the sour taste of Covenant from my mouth (yes even after years), this was probably the best thing that I could have found. Lots of tension, the characters are multidimensional, the setting is intriguing and the story is surprising well written. If you're an Alien fan, then there is no reason to not have a listen! Brilliant, highly recommended for Alien fans! Great story, really well acted, fab sound effects. I have listened to some great Audible books, this is one of my favourites! Absolutely perfect. Everything about this is 100% perfect entertainment. I loved every second of it. Slotting in between the two greatest movies of an iconic Sci-Fi horror series is no easy task and yet I was beyond impressed with Alien: Out of the Shadows. From stunning sound design and a stellar cast to the pacy plot that isn't afraid to subvert expectations, this is a thoroughly enjoyable entry that deserves to be lapped up by as many fans of the franchise as possible. 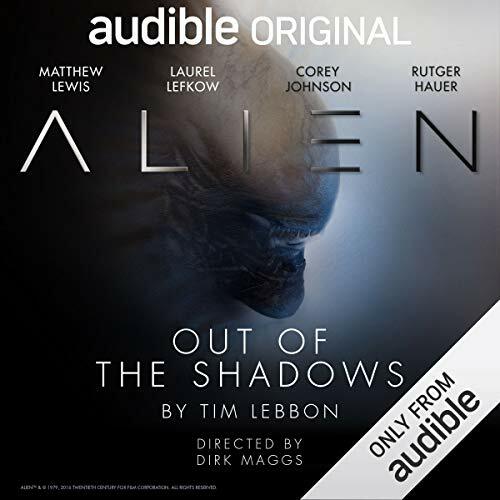 it's easily worth a listen just for the phenomenal performance by Laurel Lefkow as Ripley (if you had any reservations about another actress taking Sigourney's place, prepare to have your fears put to rest) and her chemistry with Corey Johnson as Hooper just makes the drama even richer. Highly recommended.